We have quite stoney ground so I have always grown carrots in a variety of deep pots. Today I planted my first batch of main crop carrots. 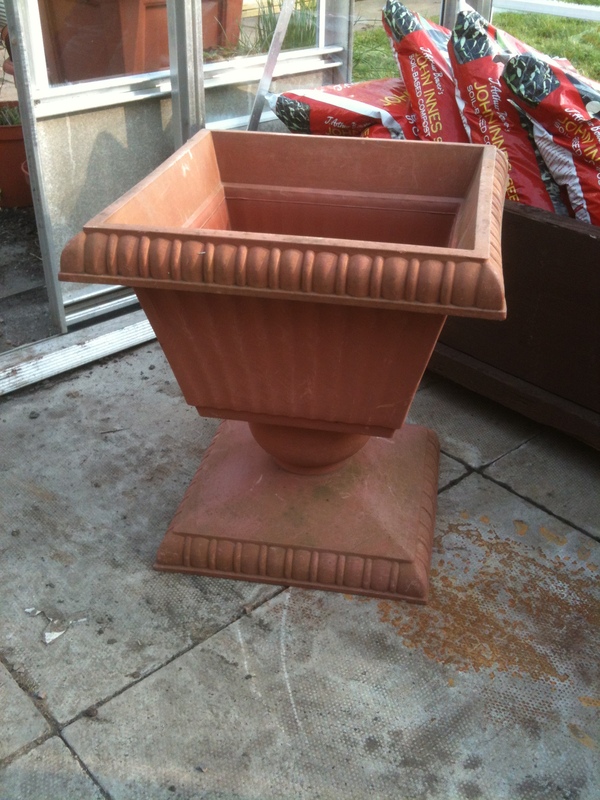 I use these square-ish flower containers as they are deep enough for the carrots to grow and it can be moved around the garden. I put crocs (bits of broken china, bricks and stones) in the bottom for drainage, fill with multi-purpose compost (or some of my own when it’s ready), add a thin layer of seed compost, water, sprinkle the carrot seeds over the surface then cover with a thin layer of seed compost. I will keep them in the greenhouse until there is no more risk of frost and then I sit the pot up on blocks in a sunny spot in the garden. 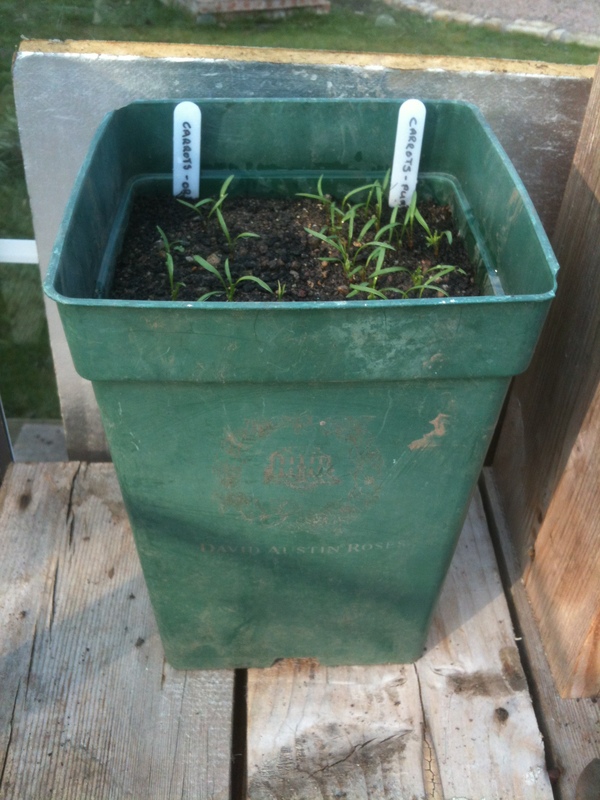 I have always just sprinkled the seeds on top of watered compost and let them grow. You are supposed to thin them out but I have never bothered – just don’t sow too many seeds and they will all have plenty of room. It is also suggested that you sow seeds every 2-3 weeks to provide a continual supply but I have found that as long as they are in the soil they will last for months. There is nothing better than nipping down to the bottom of the garden and pulling some carrots to have with dinner. I will probably plant another pot in 6-8 weeks and that should see me through to autumn. Last year I grew Purple Haze and Autumn King 2. 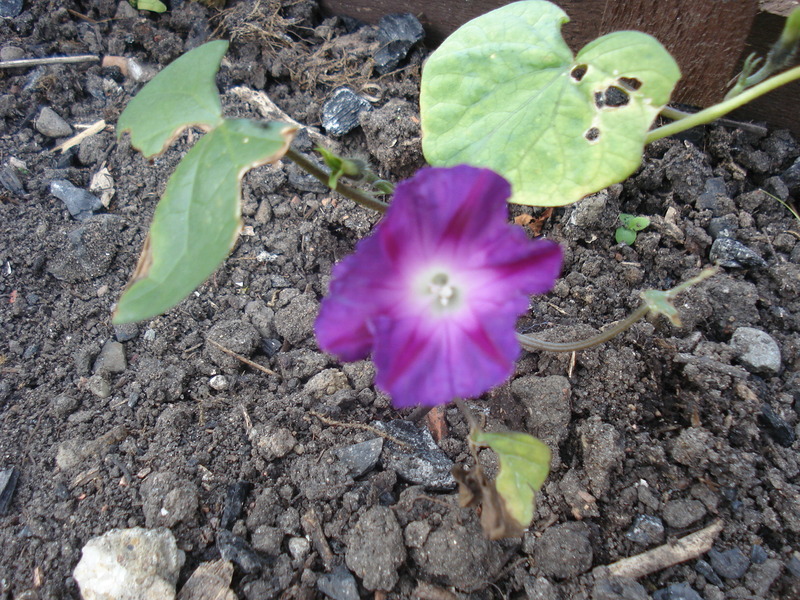 I mixed the seeds and planted them together so it was always a surprise which colour came out of the pot. It is a good mixture and they look great on the plate. 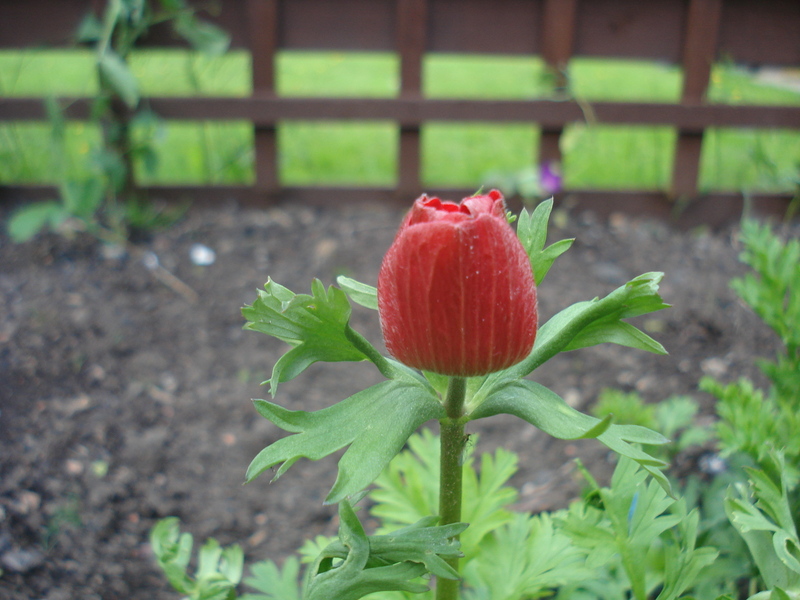 I still have seeds for both varieties and will continue planting them until I run out. Now I know that carrots were originally purple and it was the Dutch that changed the colour to orange. 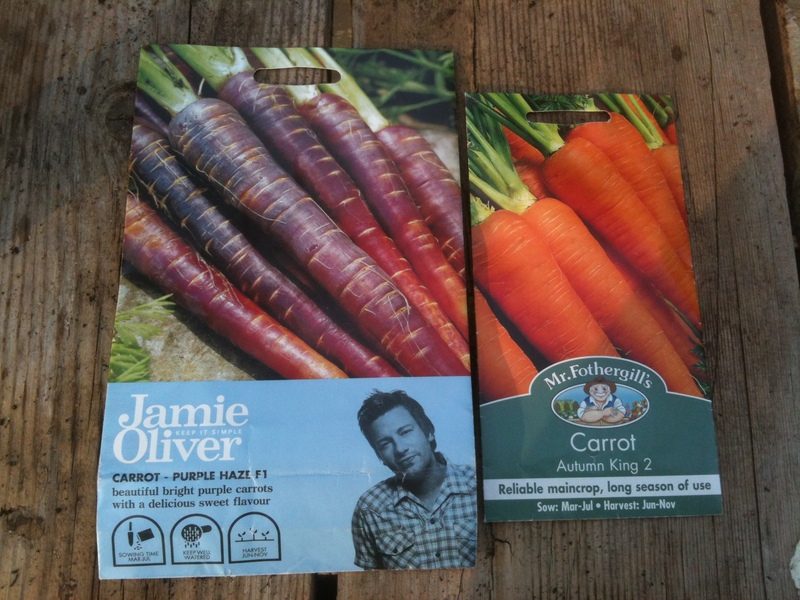 I admire Jamie Oliver for trying to bring back traditional varieties of vegetables, in this case Purple Haze carrots. However, purple carrots MESS WITH MY HEAD and I’m not sure I will grow any more once the seeds have finished. They look like carrots and taste like carrots but they are purple. Sometimes you just want some nice orange carroty loveliness covered in butter without confusing your brain. Life is too short and the novelty has definitely worn off. This year I read that to get an early crop of carrots use a deep pot, such as a rose container, and bring seeds on in the greenhouse. Here are some I planted on 18 February. I will let you know if they are ready to eat any earlier than the main crops planted today. If you are planning to grow carrots, keep them at least 18 inches above the ground. The reason? Apparently carrot root fly grubs cannot fly! Keep them well watered during dry spells as this stops the roots from splitting. Wait until the carrots are in the kitchen before tearing the tops off. The smell of bruised foliage attracts carrot fly. To store them over winter, any soil should be removed and they should be kept in sand in a cool dark place.